With the legalization and decriminalization of the consumption and possession of marijuana in Canada and the United States, the cannabis industry has become a prime target for the growth, disruption, and innovation of tech-based advancements. Although this socioeconomic revolution may have been unexpected, it cannot be overstated, as numerous sectors within the industry are currently experiencing major disruption as a direct result of the intersection of legal cannabis and tech services and products. The applications for these tech advancements is staggering, as cannabis operators are not only catching up with and adopting cutting-edge technologies, but they are also inventing their own for the industrial, agricultural and supply chain management sectors. Now, while major disruptions in these areas, such as intelligent lighting, product testing technologies, and industrial hemp processing, are pulling major attention, there are smaller tech-driven disruptions expected to hit the market soon. This will include things like social networks, new financial tech support, and even self-serving vending machines and it is without a doubt that these new technologies will continue to be refined, re-imagined, and re-introduced over the coming years as more companies and brands get in on tech and cannabis. In a lot of cases, large and established companies often cater to their largest and most demanding customers, leaving smaller businesses to utilize disruptive technology to target clients or customers that get overlooked. For companies that are willing to take risks, incorporating disruptive technologies into their business operations early on, can become innovators of the technology and gain an edge in the market as a result. It is important to note, that disruptive technology does not have to be better than what is currently offered on the market nor does it have to be completely different, it just has to be something that significantly alters how the majority of companies do business. Common examples of disruptive technology include eCommerce platforms, smartphones, and smart speakers. consumers who want to purchase cannabis have access to easy-to-use mobile applications and online ordering websites, however, dispensaries, do not. Rather, a lot of the time dispensaries are stuck ordering through e-mail or text messages. LeafTrade looks to remedy this through its centralized wholesale platform which allows vendors and dispensaries to browse trending products, request samples, streamline order fulfillment, utilize loyalty programs, and have direct access to reports and analytics. is aiming to bridge the gap between connecting investors and founders within the industry. Their platform connects entrepreneurs who need capital to individual investors. Investments can range anywhere from $2,000-$10,000. while cannabis is becoming more socially accepted in mainstream society, not everyone is comfortable with it and as such, not everyone wants to share their experiences or opinions through traditional social media channels. Kannatopia looks to answer this by providing users a safe space to share reviews, talk about strains and accessories, even leave opinions about dispensaries and view guides. Businesses are also able to create profiles for advertising purposes and customer engagement. launched back in 2014, this national marijuana cultivator has become one of the largest in the Chicago area with over 600 employees. The company uses data-driven analytics to create strains that meet consumer demand. What Are 5 Trends We Should Look Out For in 2019? 1. Self-Serving Smart Vending Machines Will Pop Up. Although a lot of companies in the industry have tried creating vending machines, many have failed and given up due to technical glitches in design or software. However, a company called American Green has made a prototype that will check a customer’s ID using biometric verification, eliminating the need for the vending machine to have a human seller present. This smart dispenser is automatic, self-serving, and comes with a wide variety of features including card readers, biometrics, payment options, cameras, speakers, touch screens, keys, and expandability. 2. The Cannabis Supply Chain Will Become Unified. As licensed growers are still figuring out how the business side of the cannabis industry works, sellers, distributors, and growers are all coming together to hash out what business practices need to be upheld under one unified supply chain. This is occurring because state-by-state legalization is causing the industry to scale up, fast. 3. The Mobile Marketplace Will Become Filled With App-Based Applications. As the cannabis industry continues to ramp up, the mobile application marketplace is only going to become more saturated with marijuana-specific solutions. As of right now, a simple IOS or Google Play search brings results in almost every major category: education (Leafly), social media (MassRoots & HighThere! ), Eaze (delivery), Weedmaps (local dispensary connection), AuroraMJ (Canadian medical cannabis), and even marijuana growing via IoT (Grobo). 4. Federal Prohibition May Be Circumvented by Fintech Support. 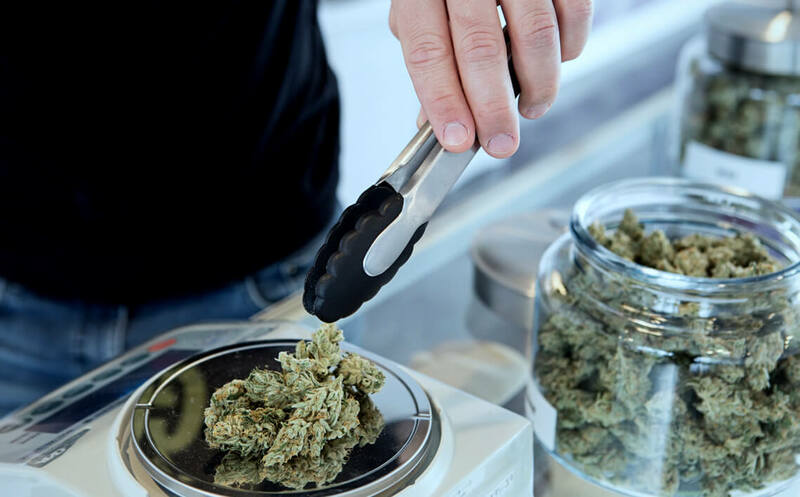 More and more companies are providing solutions to dispensaries and vendors who are currently unable to open bank accounts and use regular payment systems for their sales. For instance, some dispensaries have cashless ATMs on-site which provide a voucher for that specific dispensary. There are more digital wallets popping up as well like PayQWick (similar to PayPal) and POSaBit (blockchain) and even a debit card specifically built for the cannabis industry – CanPay. 5. There Will Be New Social Networking Sites Created. Expect more social networks to pop up this year, as more individuals will be requiring places to express their opinions on cannabis-related topics. As of right now, there are a couple of dozen already in operation, such as WeedLife, GrassCity, Duby, HighThere, Joint Buds, MJLink, Weedable, CannaSOS, and MassRoots. As the cannabis business keeps on developing and be plagued by cutting edge innovation, an ever-increasing number of organizations are urged to get into the market. With our experience, learning, and neighborhood nearness in the Western market, we can help hoist your cannabis organization to the following dimension by utilizing shrewd arrangements. Hoping to get into the cannabis market and however don’t know where to begin, contact us now for help.